MAGENTO 2 MAXMIND FRAUD PREVENTION MINFRAUD. ABOUT MAXMIND MAGENTO 2 FRAUD PREVENTION MINFRAUD. Detect fraud and minimize risks with the WeltPixel MaxMind Magento extension. Ensure that all orders are evaluated and receive a risk score with the best fraud prevention Magento extension on the market. Fraud check is very important, and our Fraud Prevention and Risk Scoring module for Magento 2 will assist you in monitoring, detecting, and preventing fraud in your online store. This extension uses real-time fraud analysis from MaxMind, an industry-leading provider of IP intelligence and online fraud detection tools. The module determines the chance that a transaction is fraudulent based on multiple factors, including whether an online transaction comes from a high risk IP address, high risk email, high risk device, or anonymizing proxy. Prevent fraud by automatically placing On Hold orders with high score risk. Instant fraud score check when order is placed. Customizable fraud score limit, set your own fraud score limit. Check only orders with a specified minimum order amount. Automatic Email notification when an order is placed on hold due to high risk score. IP exceptions, do not check fraud score from excepted IPs. Force IP, possibility to use MaxMind fraud prevention services on local installations. How does the minFraud service work? Along with this extension, a MaxMind account is necessary - you can create one here. The module integrates the MaxMind Risk Scoring service (from only $0.005 an order) with your Magento 2 store, and identifies risky orders to be held for further review by your support center. For example, what if an order was placed from a computer in a suspicious country but the shipping address is in Germany? You should be able to easily identify those kind of orders. Suspicious orders such as these will be flagged automatically by our fraud detection extension. All orders will be verified and scored for fraud risk using MaxMind minFraud service using a 1-100 (highest) score. Easy integration in your Magento 2 store. The module installs into your Magento store without having to modify your code. 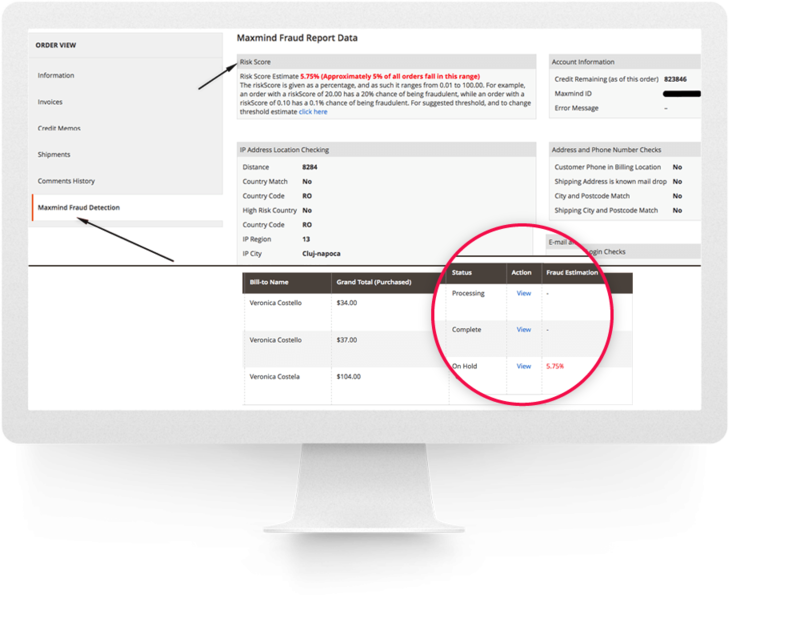 Order scores are displayed in the summary Sales Order view and detailed information about the order score (and elements that contributed to it) is visible in each individual order. After you install the extension you just need to create a MaxMind account, fill in the credentials and your orders will be reviewed for fraud detection based on the risk threshold you set in admin. All orders which get a score above the threshold will appear in red and placed on hold for further review. Before installing MaxMind Fraud Prevention Extension on a Magento 2 store please check the extension compatibility. This extension is currently compatible with the following Magento versions 2.0.X. - 2.3.1. It is recommended to install the extension first on a testing server before you install it on a live (production) server. Step 1. Remove extension code under app/code/WeltPixel/Maxmind before adding the new extension files. The extension may be refactored and old unused files may cause random issues so it's best to only keep the latest version of the files. Force IP - for debug only, this IP will overwrite the order IP address. Leave this field blank when you are using the module on a live store. If you are testing on a local installation or in an environment using a private IP, make sure to enable this option and add here a Public IP address in order to be able to use Maxmind Services on local environments. IP Exceptions - Add IP's separated by comma. Orders placed from this IP's will not be checked for possible fraud. Minimum Order Amount - Minimum amount for order to be checked for possible fraud. All orders above this threshold will be checked for possible fraud. Leave the field blank if you want all orders to be checked. Api Hostname - MaxMind automatically picks the data center geographically closest to you. In some cases, this data center may not be the one that provides you with the best service. You can explicitly try the following hostnames to see which one provides the best performance for you. MaxMind License Key - the license key obtained from maxmind.com. For Magento, MaxMind only allows the use of Legacy minFraud services, please ask for this to be enabled in your MaxMind account. Disable cURL Server Certificate Check - For temporary server certificate issue. You can set cURL to accept any server(peer) certificate. In Admin > Sales > Orders > you can check in the last column “Fraud Estimation” the risk score othe every order. In Admin > Sales > Orders >View > Maxmind Fraud Detection you can check the entire report data. IP Address Location Checking - information regarding the location where the order was placed. All this information is visible for the administrator. Based on this information you can decide what to do with the orders which are above the threshold score and are set automatically ON HOLD, if the Hold order option is set to Yes. Added email notification functionality. Now you can configure to receive an email once an order is placed "On Hold" due to high risk fraud score. You're reviewing:MAGENTO 2 MAXMIND FRAUD PREVENTION MINFRAUD.